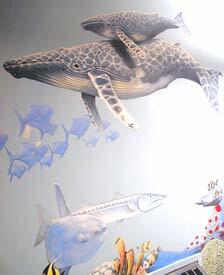 It began as a Preschool wall project and ended up as a huge 10'x30' mural with over 30 species of marine life! The Big Humpback Whale pictured here swims at the end of the mural (left to right) leading the majority of the marine life in the direction to the church stairs! 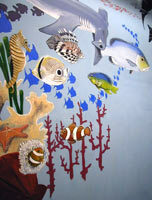 Begin this large mural (from left to right), along with baracuda, sunfish, coral reef and much more! 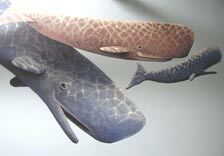 Down about 7' the sperm whales swim together as the sunlight dances upon their lives. Kids, don't get too close to this one! 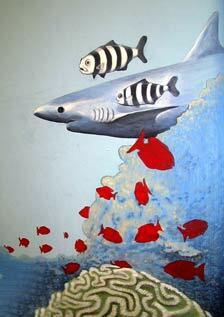 This reef Shark with pilot fish are in search of their next meal. The brain coral at the bottom makes a nice compliment to the design. 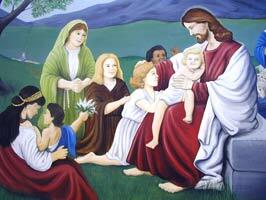 Also in the First Presbyterian Church, we painted a 17th century reproduction of "Jesus with the Children". 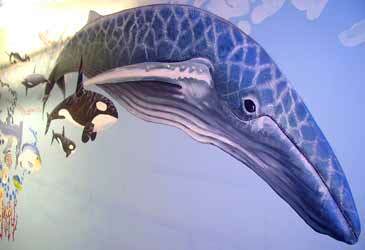 It is featured in a Children's Nursery just down the hall from the whales! It is 3'x4'.